Sure, no one likes when the lose their keys or their phone, but if childhood games like hide and seek and Marco Polo, or stumbling across a random dollar bill on the street have taught us anything…it’s that sucessfully finding hidden things can be loads of fun! 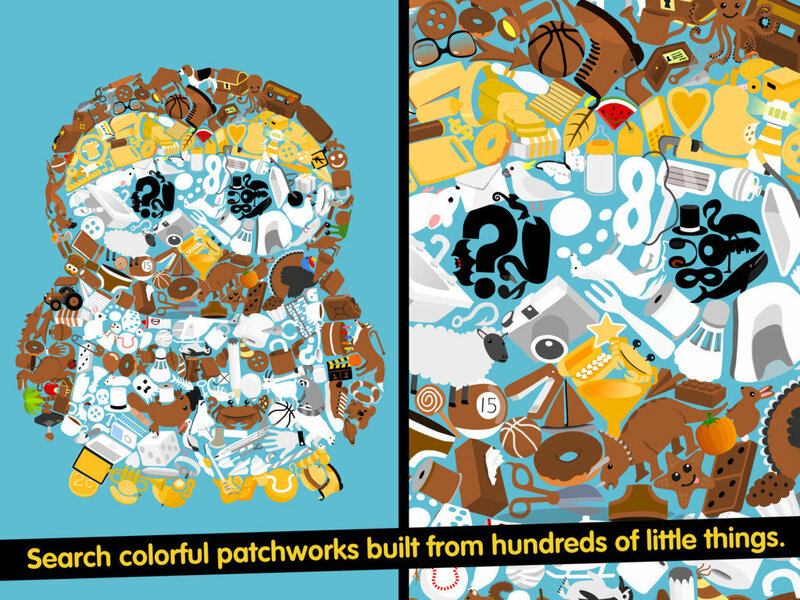 Back in August of 2010 KLICKTOCK released a game (exclusively for the iPad) called Little Things®. Players were tasked with finding things of varying shape, size, color and orientation from a the huge collection of things on the screen. When viewed from afar the groupings of little things actually, form a much larger object like a pair of scissors or a fish, etc. Unfortunately at the time, I didn’t have an iPad, so despite really enjoying KLICKTOCK’s previous hidden object games, Super Search 60™ and Doodle Find™, I never played it. Today, KLICKTOCK released a sequel called Little Things® Forever which apparently has “hundreds of improvements over the original” (though I cannot tell you what these are since, as I just mentioned, I never played the original). However, I will say that this game is pretty darn fun, and unlike the original, it can be played on not only your iPad, but your iPhone and iPod Touch as well. The way the game works is that you are presented with one of the unlocked levels. You are then given either a random list of things to find (without any time limit) or you may see a countdown timer and a single thing listed. In the timed levels, once you find the initial thing, a new thing will be listed and you keep finding the things until the time runs out. Each time you complete a level, you are rewarded with a puzzle piece. Once you collect nine puzzle pieces (101 in all) you must then correctly join them together like a jigsaw puzzle, and this will unlock a new level which will now be part of your random rotation. The hidden little things that your are looking for (books, balloons and even a kitchen sink) are very reminicent of those used in Super Search 60™, and things may not be their expected color (a white fire hydrant, or blue basketball) adding to the difficulty. 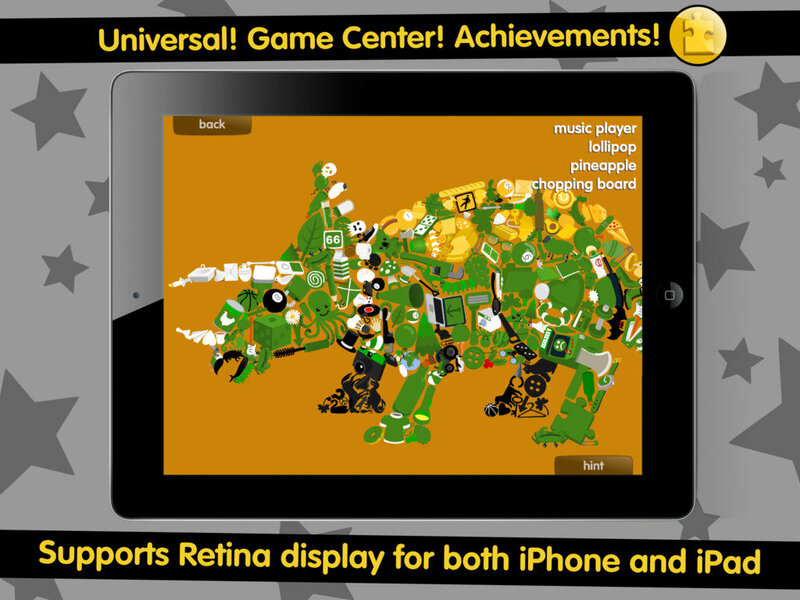 You simply drag the screen to adjust your view of the objects and you can pinch to zoom in for a closer look. When you find the thing you are looking for, you just tap it and it will be removed from the list. If you get really stuck, you get a seemigly unlimited number of “hints” which equates to a spotlight that slowly zooms in on one of the hidden things, narrowing your search area as it goes. I would have prefered that the hints need to be earned, but I suspect that the unlimited number is there to avoid frustration by novice players. While the placemnet of things in a particular level never change, the list of things you need to find does. So while you may start to memorize portions of levels (though there are quite a few!) the randomness of the objective lists means the gameplay is always unique. I’ll admit, that although I wished the original had been a universal app as well, I always wondered how well the game would actually play on a smaller form factor device. The smaller screen would certainly would mean a good deal of zooming and panning around the screen, right? Well, yes it does, but that is not necesarily a bad thing. In fact, I have logged at least three times as much playtime of Little Things® Forever on my iPhone versus my iPad. The panning and zooming actually feels quite natural and helps you focus in on areas on the screen more closely, reducing your chances of glancing over an object and missing it. If you only have a small screen iOS device, don’t let this scare you away from Little Things® Forever, you are in for a great user experience. Little Things® Forever is a delightful hidden object game, with crisp clean Retina graphics and intutive controls that make it instantly approachable for players of any age. However, smaller kids who are not yet able to read, will need to be told what they should be looking for. There is also a Game Center leaderboard tracking the highest total cumulative number of little things found, achievements and the ability to save more than one player’s progress on the same device. More frugal app buyers may balk at the game’s $2.99 price tag, but the randomness of the which levels you play and lists of things to find means this game has a HUGE amount of replayability.